Do you know what you’ll be posting 90 days out… or at least a general Instagram content plan? If your first thought was either oh sh*t that’s crazy or that must be nice, but would never work for me — I hear you. I am not a planner by nature (which brief pause for ironic laugh as my current job title is literally “merchandise planner”. ), planner meaning as in scheduling or keeping a calendar. It’s not something I get overly excited about. I’m pretty go with the flow and super cool with flying by the seat of my leggings. Ya feel me? But as I started to get serious about Instagram and developing a social media strategy, I realized the time had come that I needed a better marketing plan. Or maybe just a plan, period. And so I got to work. What started off as a simple goal of having an Instagram plan turned into something I feel will be a total game changer for any online shop (we’ll get to that in a bit). First I wanted to share my reasons why I think planning 90 days ahead on Instagram is so dang smart + what it really means to “plan” 90 days of content. Some people don’t like the idea of pre-planning Instagram content. It’s supposed to feel ‘in the moment’. But if you’re using it for business and want to see results, you need to have an Instagram content plan + schedule in advance for four main reasons. And while you are planning in advance, it doesn’t have to mean everything is perfectly staged or inauthentic. You can still be genuine and thoughtful and real. You can be you. Just a more planned out, got your bases covered kinda you. Do you really plan out 90 days of content at once? Calm down kittens. I’m not at all thinking you’ll sit down one weekend and take 90 gorgeous photos and pen your next novel. While you totally can work up to one or two week chunks, planning your content means just that — creating an overview of the topics, messaging and direction of the content you’ll post. It’s about having a clear direction for your Instagram so you can post with intention to increase engagement, meet your business goals, and grow your income. Planning product launches or big sale events can take up a lot of your time. Like hellllo to do list. So the last thing I want is to totally drop the ball on promoting the dang thing. If you know you’ll be launching your summer line in May, it makes sense to start preparing promotion content ahead of time. This means you can spend your launch actually focusing on the product, engaging with customers, and keeping the other 45 balls in the air. Plus, you’ll be able to do all parts of the promotion well. Ya know, building interest before, sharing the news, and having a killer post-launch plan. One thing we sometimes mess up on Instagram is giving our customers time. Time to learn about us, time to make a decision, and time to actually ship it!! As an online shop, you have to work a little further in advance then say, a brick and mortar location, because if someone needs a “last minute” Mother’s Day gift, we can’t actually wait until the last minute! Promoting Mother’s Day gifts just the week before doesn’t leave a lot of wiggle room for them to submit the order, for you to pack + ship, and for them to feel confident it’ll arrive before they hit the road to go visit mom. Having an Instagram content plan will allow you to see the bigger picture – not panic the week before. This will give you more time to create a mini marketing plan not only for Instagram, but so you can also include an email campaign or blog post strategy. Coming up with photo ideas every day can be overwhelming. Trying to take those photos every day? Down right exhausting. Think of idea, pull together props, wait for light to be right, set up “photo studio”, still waiting for those clouds to pass, take 10 photos, edit, hate ’em all, realize 30 minutes have passed, *insert curse word of choice*, throw it up anyway because you need to get back to work. Let’s eliminate some of that. By planning your Instagram ahead of time, you’ll know what photos you want to take and can batch your photography once a week. Easy, fun, and under perfect lighting conditions. And hey yo, if you’re looking for Instagram photo ideas… check out this post. If you’re working with other small businesses, bloggers, or brands, you know you can’t just contact them one day and expect it to go up the next. Most people who are killing it on Instagram are working on their social media and blog content in advance. If you’re looking to work with a large Instagram account, working with them on a similar time frame will help put you at their level. I love, use, and recommend Later for scheduling your posts ahead of time! It’s super easy to use, has been coming out with a ton of great new features, and starts you out with 30 free posts a month (plus an extra 10 if you sign up with my link above). And Instagram also just announced they’re allowing auto-posting, so truly a set it + forget it, no reminders kinda deal. I talk about Instagram auto posting here, as there’s a few things to consider, like that only certain tools are Instagram approved for it (auto-posting using others could get you in trouble). Let me introduce you to IG90: Creative Instagram Plans. I’ve been frustrated for you about the lack of quality Instagram resources that help you truly show up and serve your customer, not just how to set up your bio and tell you to post “quality content”. If you’ve been around The Shop Files for awhile (or heyyy girl if you’re new! ), you know I don’t like fluff. This is not another Instagram 101 “How to create a killer bio” type of course. In fact, I didn’t even want to call it a course, because it’s an actionable, repeatable plan. It’s legit. You can use and re-use these strategies and prompts for an entire year. And then start all over again. IG90 helps you show up for your customer every day. Curious? Check out the sales page here. Here’s what Valerie had to say! After implementing just a fraction of the tips learned in the first portion of the course, I posted one of my products on Instagram and sold it in less than thirty minutes! My main struggle was knowing what to say in my posts, and this is why I felt the need to do the course. 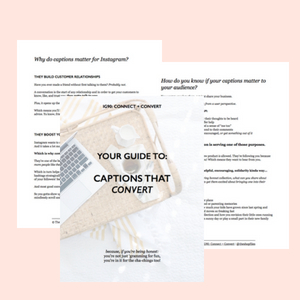 The advice I learned from IG90 not only helped me craft Instagram post descriptions that sell, but learning what to say also helped me formulate hashtags that would reach clients and not other Etsy sellers or stationery designers. And how Stephanie knocked out a whole month, easily! I’m loving your resources. You really digest things down to something I can absolutely grab onto and run. Your inverted method to creating content is SO much more accessible to me. Thank you so much for putting all of this together for us. I’ve finished writing out the whole month of April for plans, I know what I’m going to say each day, I know what I’m targeting each day – including two promotions during the month and how I can manage to both hard sell and soft sell for them, and even better… I know what photos I need to take in advance so I don’t need to scramble to come up with something! A whole month! Planned! What a weight off of my shoulders. Ah, very well written, and a great reminder to be organized about posting on Instagram – I still struggle with that sometimes and I spend way too much time for posting each post manually. I also like that you use Linktree in your profile, that tool really helped me!